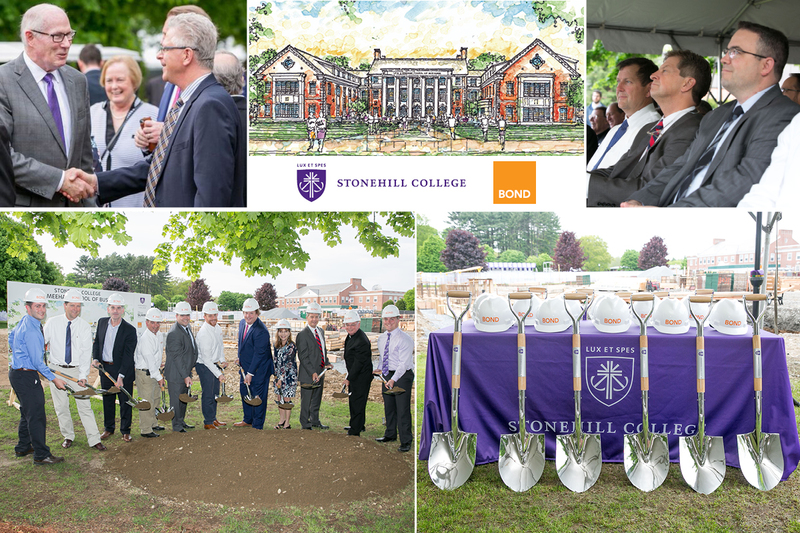 North Easton, Mass., – Stonehill College celebrated the groundbreaking of the new Leo J. Meehan School of Business, designed by The S/L/A/M Collaborative (SLAM) and constructed by BOND. The ceremony was attended by members of the College, academic administrators, trustees, students, faculty and the project team. The new $30 million Leo J. Meehan School of Business will offer 65,000 square feet of cutting-edge technology, adaptive classrooms and collaboration spaces. The building’s Georgian architecture is designed to reflect the true spirit of the Stonehill community and campus, while the interior is designed to encourage innovation and advanced business environments. Completed by fall 2019, it features innovative Bloomberg rooms, simulated trading rooms and advanced business innovation studios with maker spaces. The School will expand the curriculum and encompass the accounting, finance, international business, management, marketing, economics and healthcare administration programs. BOND and SLAM are also working together on the College’s Academic and Welcome Center, which will be completed by the fall 2018 school year. Other past partnership projects on campus include the Thomas and Mary Shields Science Center. BOND also provided construction management services for the Rev. Mark T. Cregan C.S.C. Athletic and Fitness Center at the Sally Blair Ames Sports Complex. SLAM also designed the latest Campus Master Plan, the new Residence Hall and Campus Foot Bridge. As a fully-integrated, multi-disciplinary architecture firm, The S/L/A/M Collaborative (SLAM) has a national presence in programming/planning and designing professional schools of medicine, pharmacy, nursing, public health, law, business, science, engineering, and technology. SLAM has recently completed noteworthy projects with clients from the University of Notre Dame, Johns Hopkins University, Emory University, Duke University, University of Texas at Austin, University of Tennessee, Rutgers University and the University of Cincinnati, among others. SLAM offers architecture, planning, interior design, landscape architecture and site planning, structural engineering and construction services that focus on various market sectors. SLAM has offices in Atlanta, Boston, Glastonbury, CT and Syracuse, NY. For more information on The S/L/A/M Collaborative please visit www.slamcoll.com or call 617.357.1800.